Wednesday was a beautiful day. 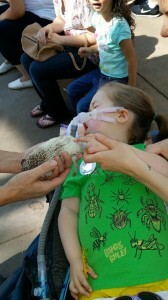 Getty got to take part in her first of two zoo school fun days. I had not bought the official Sacramento Zoo School t-shirt yet, so I thought a bug t-shirt would suffice. Before leaving I asked Getty what bug she wanted to carry with her as we got into the van. Praying Mantis was the choice and we were off. We found perfect parking and we unloaded the car and found the meet up spot. In past years I have wanted to enroll Getty in summer programs but there were always trouble with carrying it out. I simply was a loser mom and I missed deadlines. I was always so nervous about having her around kids, and perhaps the overall feeling of uneasiness of leaving the house. One can get very accustomed to not leaving the house. I can control (for the most part) what happens at home. I don’t have to worry as a mother about the elements, I don’t have to worry about germ kids touching Getty, and I certainly do not have to listen to the usual comments of (Why is she laying down? She is sick isn’t she. Stop starring honey!) I can handle comments fine, but there is a limit. Think about that for a moment. What if everywhere you took your precious child you heard comments like that. Even the subtle gaze of “something is wrong”. It wears on a mom, this mom. I want to be able to take Getty anywhere and she just be one of the kids. 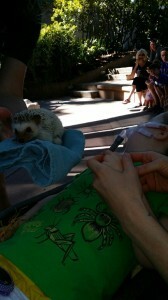 I want to thank the Sacramento Zoo for just being totally awesome! Completely accommodating. The kids were awesome. The parents were awesome. Getty’s experience went off without a hitch and I attribute that to human beings that just get it. Getty was just one of the kids. I got to just be a mom. The day started in the Discovery Room where everyone got their name button. Circle time started the day. Each child got to tell the class what their favorite animal was. I asked Getty previously what her favorite animal was at home. I showed her numerous pictures of animals and then we narrowed it down. Something told me that animals were going to be involved in this camp and I thought perhaps we needed the basics like favorite animal. 🙂 Giraffe was hands down the winner. So I verbalized the animal name for Getty to the class. There were some flamingos, bears, a hawk, lots of snakes and oddly enough a lot of giraffes. 🙂 For some of the kids that chose giraffe, it was very cute, they looked at Getty first and then said, “giraffe.” Not sure what that meant, but I took at it as a way for that child to relate to Getty. I could be totally wrong, but still it felt amazing. I can only imagine what that may have felt for Getty to know that there were more kids in the room that also liked giraffes. We left the room after sorting animals by “fur, feathers, and scales”. 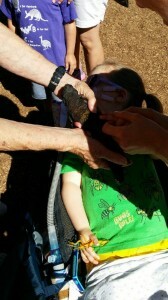 We moved on to the amphitheater, where all the kids got to touch all kinds of fun creatures. 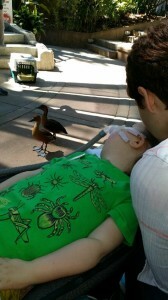 Getty felt a snake (brave little lady), a hedgehog, a lizard, and a duck (now I want Getty to have a duck). Back to the classroom for some crafts and a story. The weather could not have been better. The Sacramento weather restrained itself to the low 80’s. That alone was a huge concern for me before the day came. Sacramento is notorious for HOT weather, even in the mornings. But it was perfect! Wednesday was perfect. I enjoyed spending some great moments with Getty. I know inside Getty’s brain was blown by all of the animals and the excitement of the day with all of the kids. Life is all about moments. Wednesday was a beautiful moment and day all the way around. Heck, we were even on time, early even. 🙂 Sitting with Getty and holding her hand in the amphitheater while she gazed and touched all of the animals was heavenly. So glad we had the resources to make this day happen. I am so glad she was able to try something new and love the day. How incredible! So wonderful she can experience these moments with her classmates & momma! Kate – these are the moments that last forever… She’s such true little warrior! 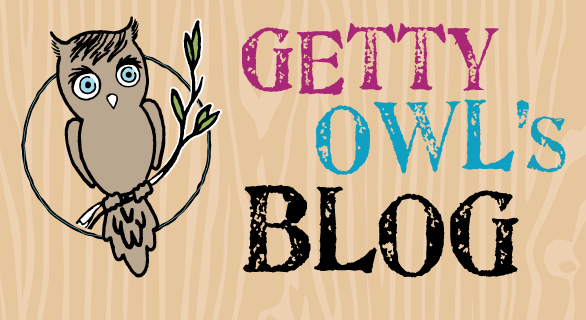 LOVE YOU GETTY OWL! I love this entry! So happy for you and Getty! 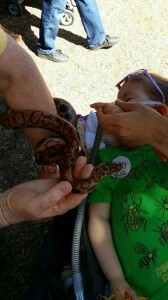 And, glad the weather cooperated and that she got to be one of the kids and you got to be “just” a mom.